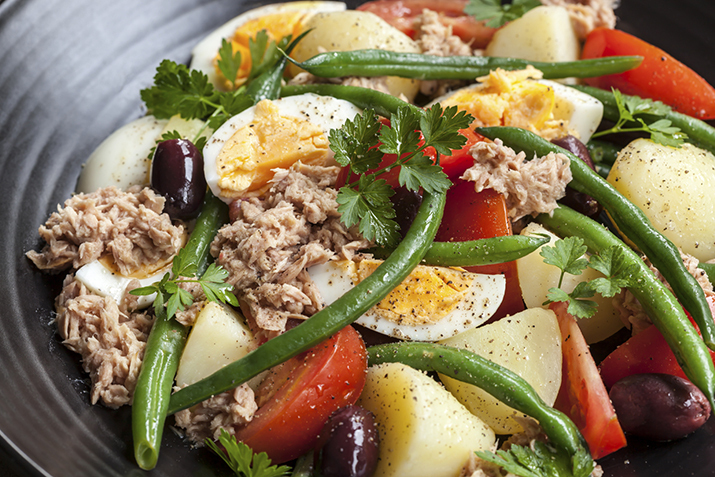 Stuck in a tuna salad rut? Try this classic, grown-up version, featuring artichokes, olives, fresh herbs, and bright citrus flavors. With a side of roasted potatoes or green beans, it's sure to become part of your regular lunch rotation. In a mixing bowl, whisk together mayonnaise, olive oil, lemon juice, parsley, basil, and garlic. Add the drained tuna and chopped artichokes, red bell pepper, kalamata or black olives, and red onion. Mix everything together with clean hands or a spoon until well blended. Serve with roasted potatoes, green beans, olives, and tomato wedges.